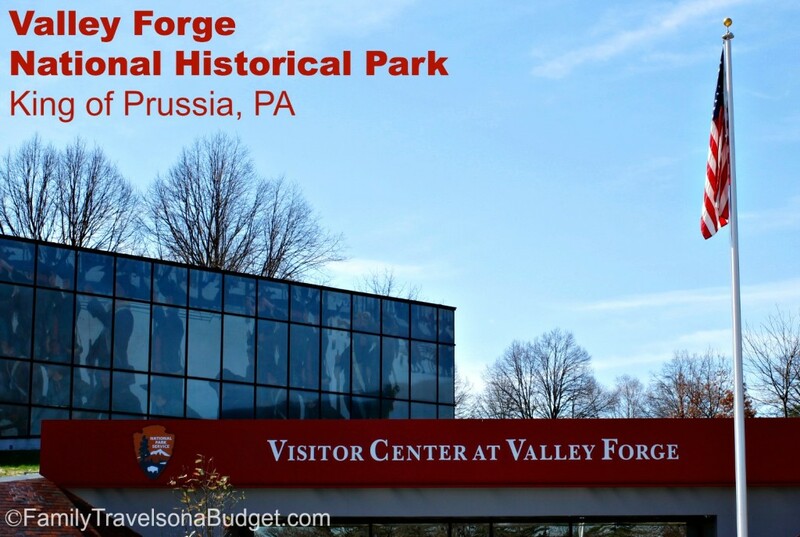 Valley Forge National Historical Park, near Philadelphia, PA, offers history, outdoor fun, picnicking areas, and family fun — all for free! This park, set on the most well-known winter encampment of the Revolutionary War, covers 3,500 acres of rolling hills, forests and streams. Miles of paved trails offer easy access to the replica log huts, monuments and Washington’s Revolutionary War headquarters. On a recent visit, we shared the trails with fitness enthusiasts, young couples, boy scout troops and families. It seemed the warm, sunny spring weather brought everyone out of hiding to enjoy the park’s tranquil setting. Throughout Valley Forge, historical figures share information about the era. This actor shares how the Continental Army built log huts, kept warm and got food during the long winter at Valley Forge. 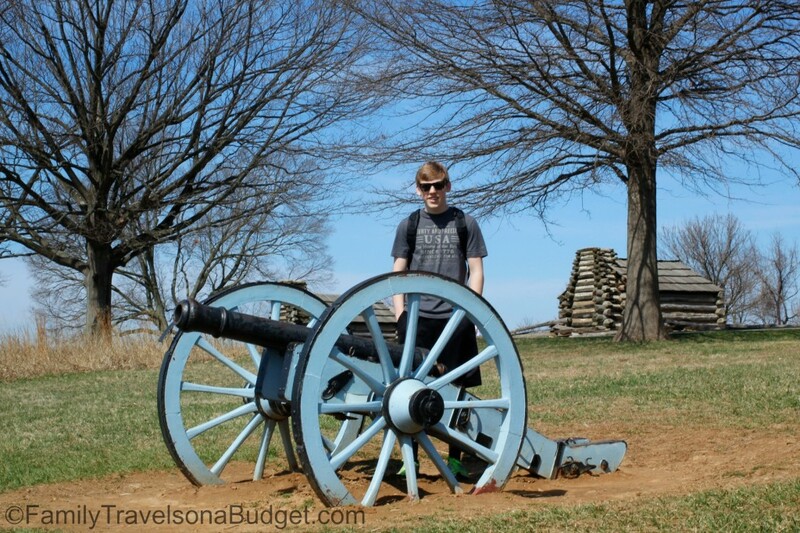 Ben stands beside a reproduction cannon set where the Continental Army would have used them to protect the ridge from attacks by the British Army from below. With the city behind it, this cannon seems so small. It was designed by Paul Philippe Cret, being a simplified version of the Triumphal Arch of Titus in Rome (A.D. 81) which marked the capture of Jerusalem by Emperor Titus in A.D. 70. 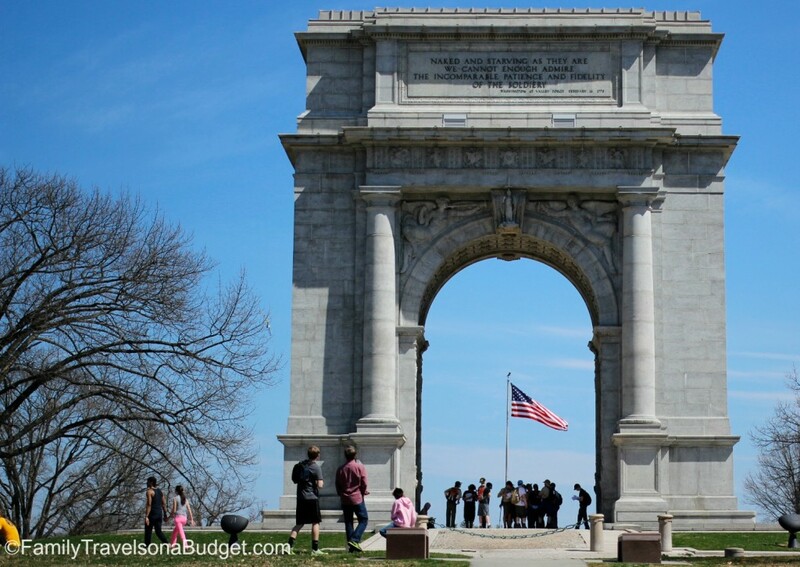 In the classical tradition, the triumphal arch of one or three openings was erected to honor Generals or Emperors, so that this memorial arch with its single opening is classically proper as a national tribute to General Washington and the army he led. 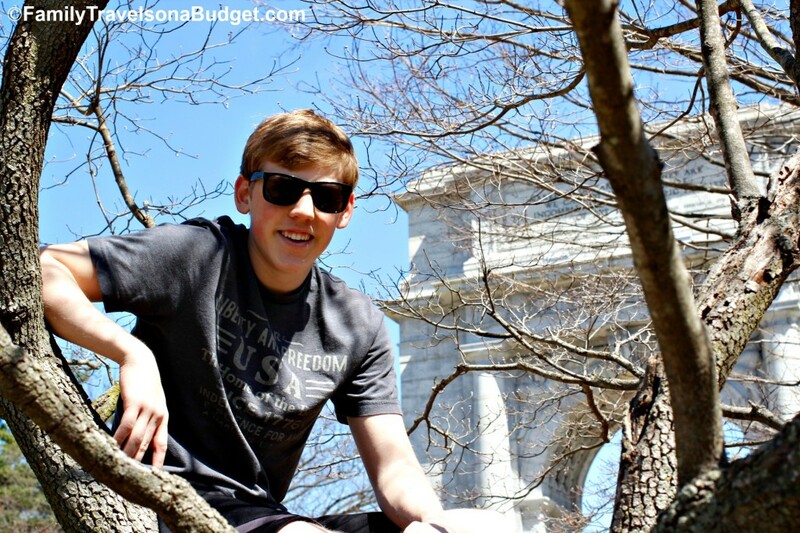 Of course, just hanging out at the arch is okee-dokee too! The United States National Park System has a junior ranger program to educate kids and make park exploration more meaningful and fun. Get Junior Ranger Program packets at the information kiosk in the visitor’s center. When kids complete a specified number of activities (based on age), they can return to the Visitor Center to receive a junior ranger badge for that park. Every park in the National Parks System participates in this program. Ellie was thoroughly captivated by the program. In the photo above, she’s studying the log hut to determine how it was made. When she got her junior ranger badge (sadly, after my camera battery died), she squealed with delight. The badge now resides in her treasure box — how’s that for a funtastic, free souvenir? Valley Forge offers something for everyone. Quiet family members can sit and enjoy the scenery. The rambunctious can run and climb — there’s so much wide open space. Information on the Continental Army and Revolutionary War is clearly presented in small amounts so antsy kids don’t need to stand still for long. I recommend wearing comfortable walking shoes, dressing in layers (especially in spring and fall when temperatures change dramatically), bringing water bottles for the family and making sure your camera battery is fully charged! If visiting the Philadelphia/Valley Forge area for a few days, break up your visit to Valley Forge. It’s a great place to spend the morning and enjoy a picnic. But, younger kids might get worn out if you try to see it all in one day. 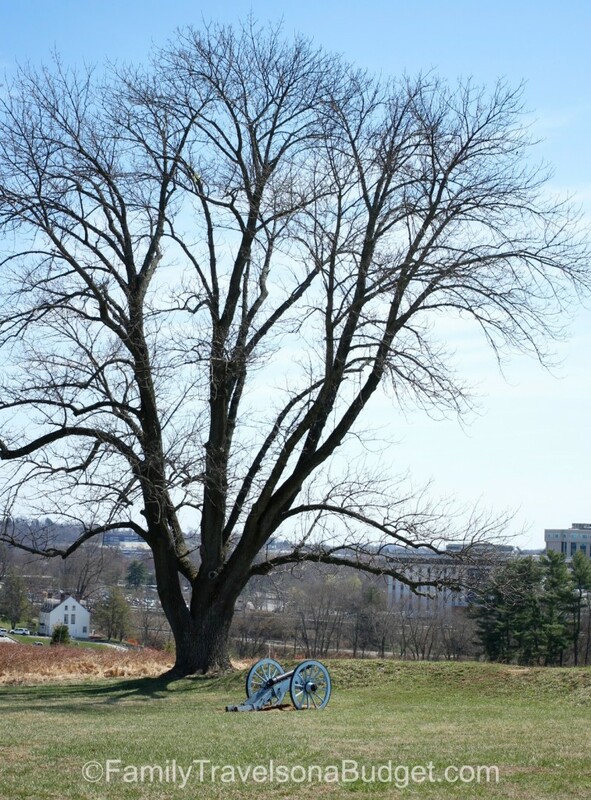 If you can only visit the park for a few hours, use the resources at the Valley Forge website to plan your visit. We spent three hours here and could easily have stayed longer. Valley Forge National Historical Park is always free to the public. Parking is also free. Families can take food onsite. Some special events and trolley tours require an additional fee. Open daily, year-round 7:00 AM to dark (1/2 hour after sunset). Open 9:00 AM to 5:00 PM daily. Summer Hours are 9:00 AM to 6:00 PM daily from June 16, 2013- August 31 , 2013. Open for touring 9:00 AM to 5:00 PM daily, March through December. Open weekends 10:00 AM to 4:00 PM January and February, and on President’s Day. Open for touring 9:00 AM to 5:00 PM daily, March through December and during President’s Day weekend (10:00 AM – 4:00 PM). Open for touring 11:00 AM to 5:00 PM Monday through Saturday and 12:00 PM to 5:00 PM on Sunday. Learn more about the Chapel’s history, services, and the Cabin Shop. Open 10:00 AM to 5:00 PM daily. Located behind the Washington Memorial Chapel. Open for touring 12:00 PM to 4:00 PM weekends from May 25, 2013- September 1, 2013. Open daily 7:00 AM to dark from April 1, 2012 through October 31, 2013 and weekends from beginning November 3, 2013. This parking lot is closed at all other times. 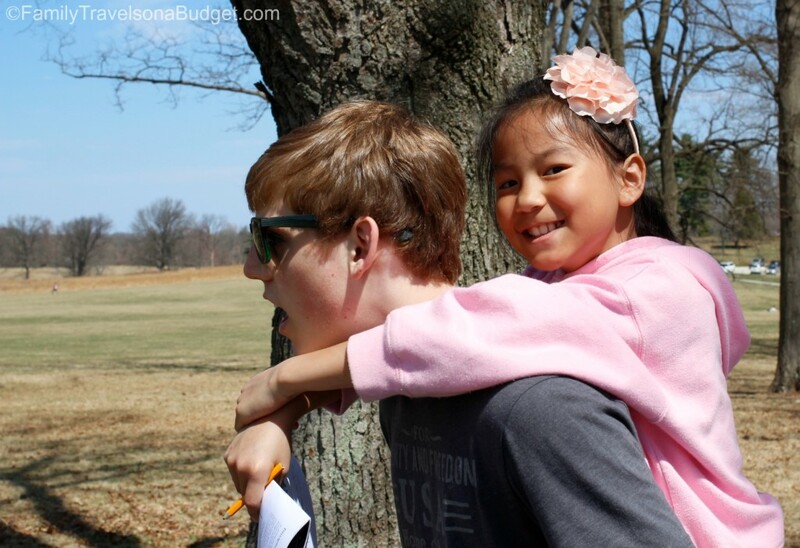 I had to include this photo of Ellie hitching a ride on her brother’s back! Priceless! 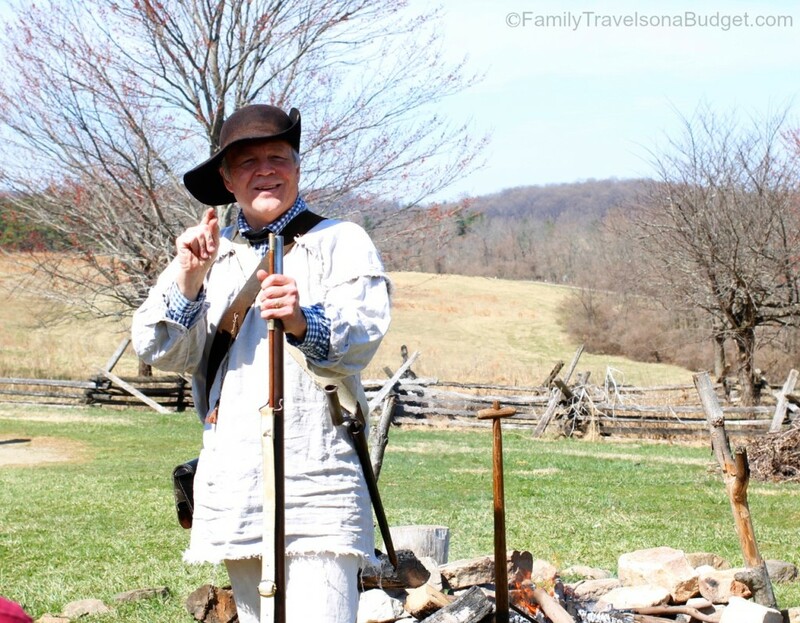 For more information to plan your trip to the Valley Forge area, visit the Valley Forge & Montgomery County web page. Which is your favorite national park? What do you like best? We took some friend’s kids and they love to run around on the mounds just before the recreated cabins. It was the fall and they had a lot of fun playing in the leaves under the trees too! Highly recommend the park with kids.